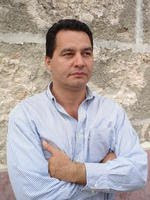 The majority of the Cuban community will celebrate Christmas and the advent of the new year, unaware that a political prisoner, David Piloto Barcelo, is serving his punishment in the worst conditions, for defending his unobjectionable right to choose a president, to openly criticize government conduct, to protest, to demonstrate, to join the party that better fits him, etc. Possibly also, the majority of Cubans will die without testing the state of rebellion and liberty that being an activist in opposition to the dictatorship offers. Piloto Barcelo practices it daily, his screams against the henchmen that mistreat us day after day in the prisons, could be heard in Prison 1580. From my barracks, some thirty meters away from his, with several walls and roofs in between, his voice arrives full of truths against the executioners in each arbritray action or appearance. His protest is constant, all in spite of his precarious health. He contracted tuberculosis in their cells, and not even that condition has impaired his upright posture as permanent opponent. 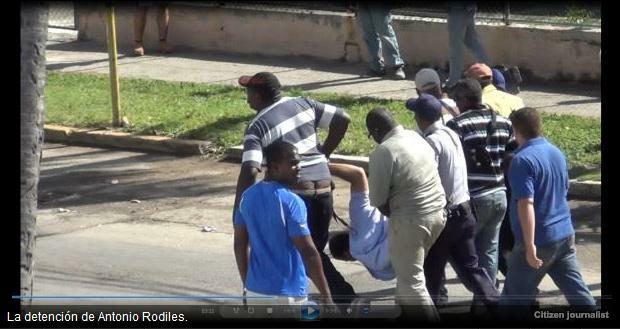 His crime: demonstrating on “Revolution Plaza” and throwing leaflets demanding the freedoms of which they deprive us. 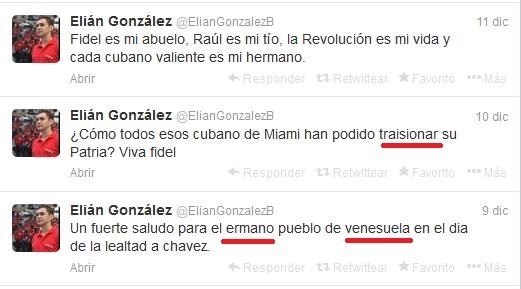 Some days ago Piloto Barcelo was transferred to Cinco y Medio Prison in Pinar del Rio. That is another punishment that he will have endure far from his family. 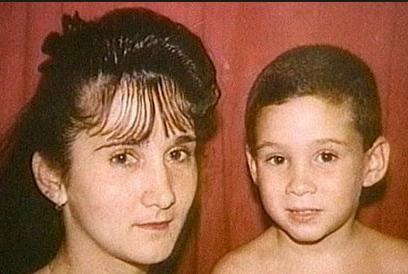 What is left, because after the State Security threatened his mother, she suffered a heart attack, and it killed her. Now his sister will have to travel to that distant place in order to provide him with what is necessary to survive, because otherwise we die. And it is not that being happy or eating turkey on Christmas is a crime; may those happy ones who manage it multiply until all Cubans can do it in their own land; but do not forget that someone suffers for you at this moment, and that he is also summoned, from wide ranging possibilities, to fight and give tribute to these human beings that have preferred the sacrifice before the pleasure. 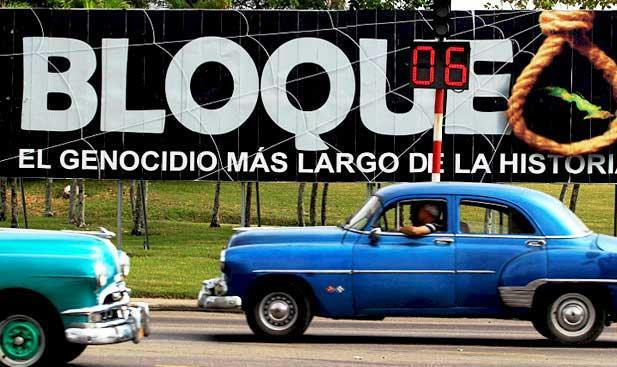 And that self denial is for the good of all, because when Cuba is free, we will enjoy it equally. 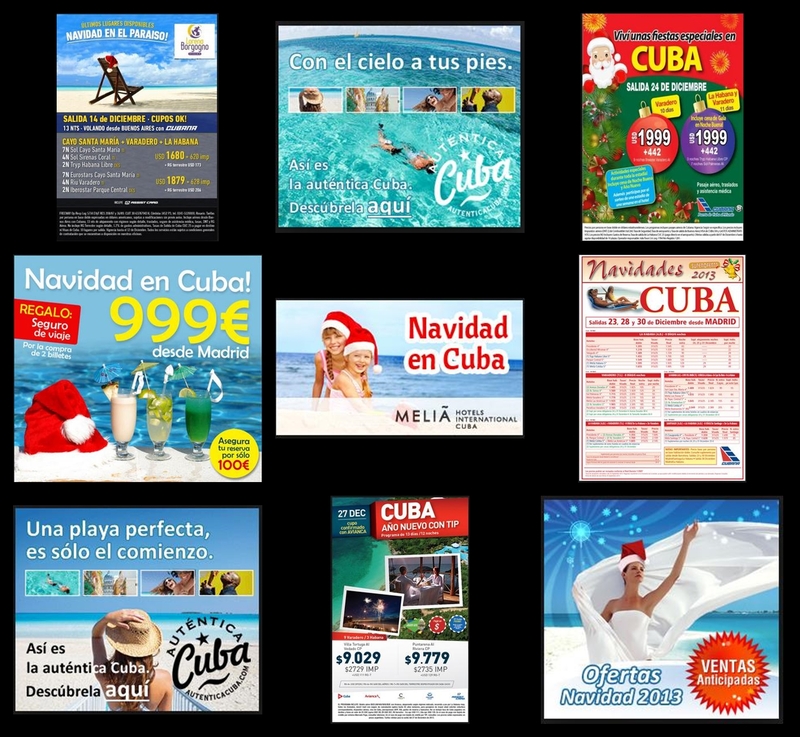 Not forgetting Piloto Barcelo, Sonia Garro, Ramon Munoz, Armando Sosa Fortuny, Marcelino Abreu Bonora, Ernesto Borges Perez, Madelaine Lazara Caraballo Betancourt, Makiel Delgado Aramburo, Ivan Fernadez Depestre, Angel Frometa Lobaina, Allan Gross, Bismark Mustelier Galan, Ángel Yunier Remón Arzuaga, to mention only a few of those among hundreds of prisoners confined plus those who are on parole and make the humiliating list of political prisoners of the Regime recently “distinguished” for safeguarding Human Rights on the UN Council. Even so, to everyone Merry Christmas and Happy New Year! At a recent meeting, a chief of prisons, publicly stated that he preferred working with prisoners versus civilians, because the latter left when they finished their 8-hour working day, while the prisoners could go many days with no rights, not even to protest, infinitesimal pay, and cheap food. Compare that to what the Cuban officials say in Geneva, that Cuban prisoners are respected with regards to salaries and hours, when from dawn to dusk the sweat runs down their poorly paid and badly fed backs. 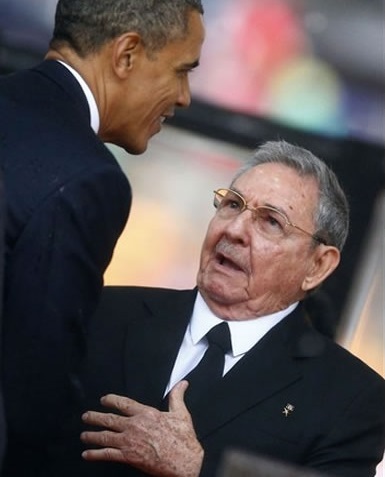 I’m sure that it must have been embarrassing for U.S. president Barack Obama to have greeted the Cuban dictator, but I can’t but admit that it was a brave act: the delicate cross of the white gloves in the face of the adversary. 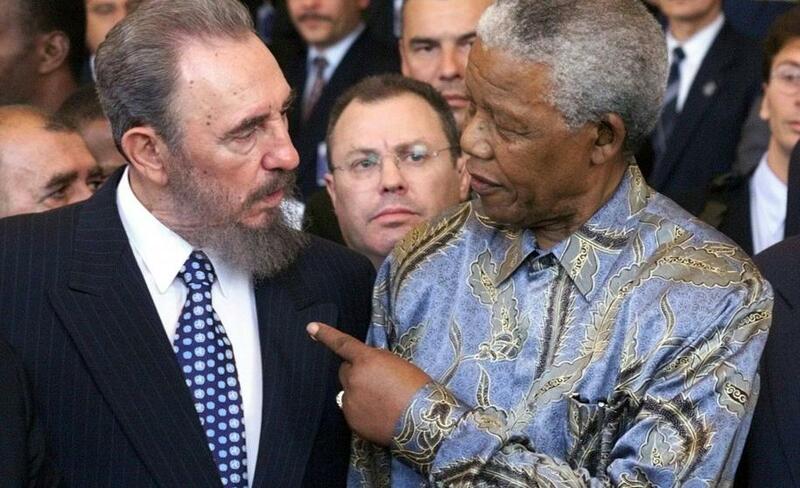 The alternative would have left much to desire and been childish; in addition, the message then delivered in the words of President Obama, when he said that some leaders pay tribute to Mandela and reject the dissidence in their own countries, was the finishing touch, and a brutal one, to the delicate sequence of his greeting. The event appears to me like a move in the diplomatic chess game, and history will remember the gesture positively. I recall a person who had an anthology about “the white gloved slap,” and certainly this will be added to his collection. And it reaffirms that there is contact between the two governments to solve some of the particular conflicts, such as the imprisonment of Alan Gross. These are times of dialog; watching what is happening in Iran, Syria, and recently in Ukraine is imposing another logical order on these times. 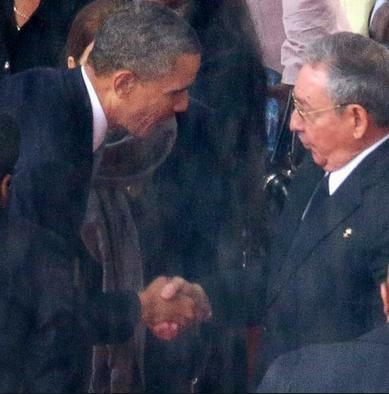 Hopefully the Cuban leader is included in President Obama’s invitation. 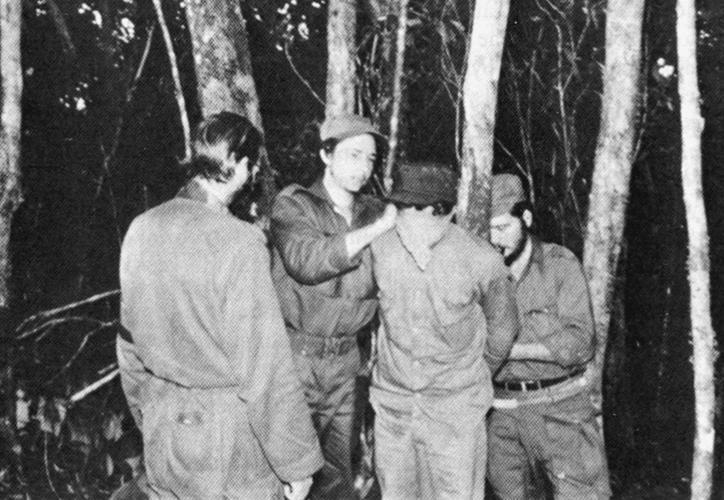 It is a unique opportunity for a phone call, and then actions that determine a democratic will, like the ending of aggressions against the Ladies in White, the arrests and beatings of members of UNPACU (Cuban Democratic Union), and the free determination of programming without assaults for the activities of Estado de Sats. It should be followed by the release of Sonia Garro and her husband Ramón Muñoz, and the hundreds of opponents that await in Raul’s jails. The dictator Raul Castro can accomplish everything with single gesture of picking up his phone. It is a unique moment that we can be sure he will not take advantage of, because the stubbornness of his brother, and now him, has not been in vain: a society has lost its values and the love of belonging to this country. However, the person who shone at that meeting was the man from the American side. There is no need to ask for a vote of confidence for him, his actions precede him. Although circumstances sometimes inspire us to be extremists, we must pause, think with cool heads, and not let ourselves be carried away by emotions. More than a handshake, it was the iron fist in a velvet glove. 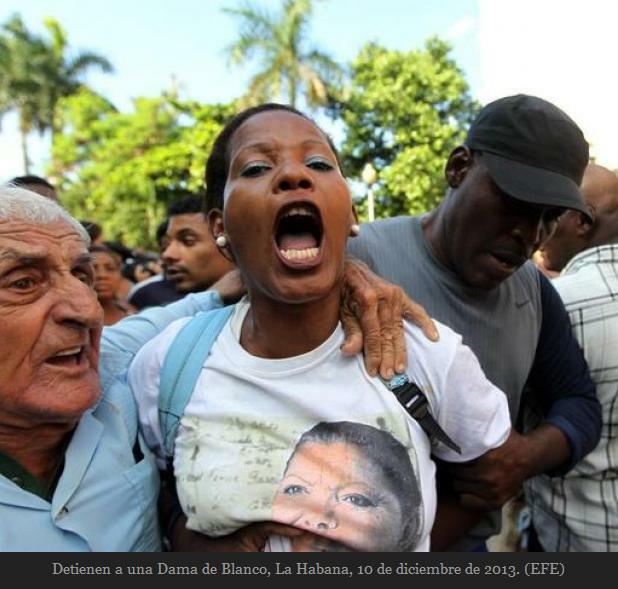 The 10th of December 2013 was the most striking example of how alone the Cuban opposition is. But I do not mean that external solitude, but the internal one, the separation that exists within the dissidence itself. We are our own worst enemies, and I recognize it with infinite pain. As we walk separated we make the work of the dictatorship’s henchmen, to beat and isolate us, easier. The day we decide to put aside personal aims and, instead, focus on the roads together, channeling our energy in unity, then our cry for freedom will be more international in scope. 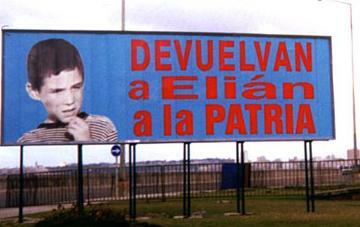 Shamefully we must recognize that personal ambition, the need to be recognized as individuals, and even the posture of those who are behind the economic aid sent by different routes to the opposition, through which they try to trip up one side, are guilty of the structural earthquake in the revolutionary block that seeks a democratic opening and impedes a broader reach for the cause of freedom. 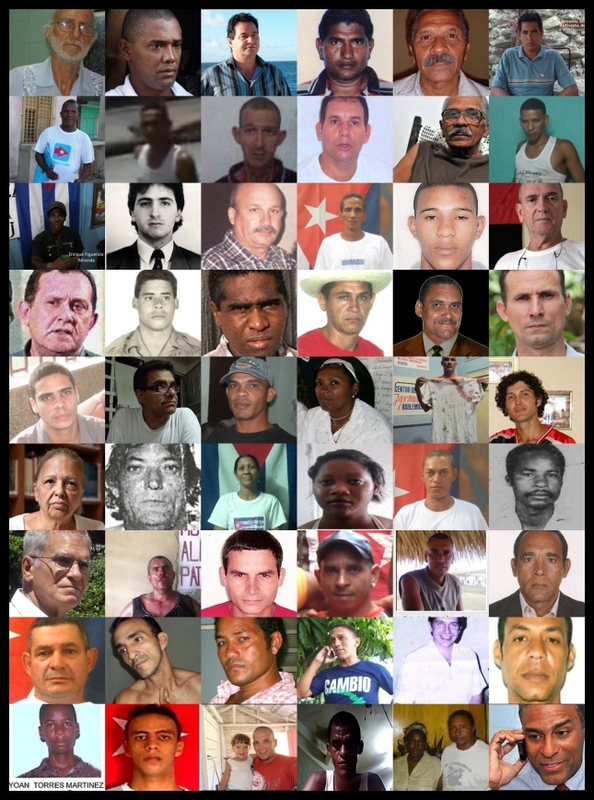 There is a case of a prisoner before he entered prison whom Amnesty International recognized by phone who was part of the list of political prisoners whom they monitor in different countries; someone inside Cuba felt ignored and torpedoed this recognition and managed to get his name off the list. This is the extreme zeal shown by the opposition. Another case is that of someone imprisoned for political activities who was linked to a dissidence group who was cut off by adverse opinions of another group in charge of legal matters which was representing him legally and before international Human Rights groups; he was thrown overboard. They felt he was no longer their problem. And in the midst of the crossfire, without any of the parties even asking him what he thought about it all. 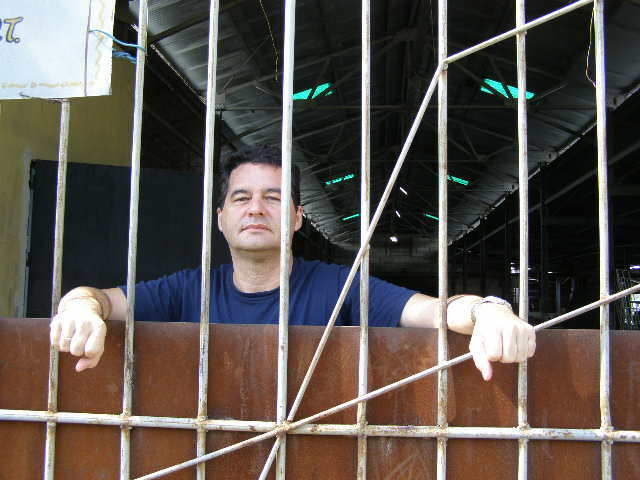 The truth is that they forgot their words of solidarity and promises to stand by his side in bad times to come for this prisoner. These leaders and groups of the dissidence itself are saving State Security a lot of work as they busy themselves torpedoing the initiatives that didn’t come from them. Differences of opinions cause them to become alienated when, on the contrary, it’s healthy to think differently about how to achieve the same ends. While these differences occur, we don’t need the repressors to do the work of rejection, to weaken the forces and ideas, as if all we all not all working toward the same ideal. We ourselves are doing that work. Hopefully we will manage to repress our impulses for personal recognition and understand that the truth and the way to achieve freedom is shared among all; and understand that it is more difficult, if not impossible, to achieve it separately. When we are capable of working through these human miseries that hinder unity and clearly alienate and make the road to democracy rougher, then we will be capable of forcing the government to sit down to talk, and the world will see is and accept us as the political force we long to be. The nation’s founding fathers, with José Martí in mind, demand this concession. 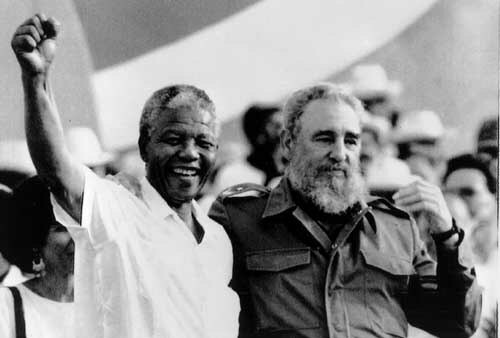 When we achieve this, we will then feel ourselves to be better human beings and better Cubans. This teenager pampered and used by both sides, has had the sad task of erasing and criticizing the dreams of his mother. 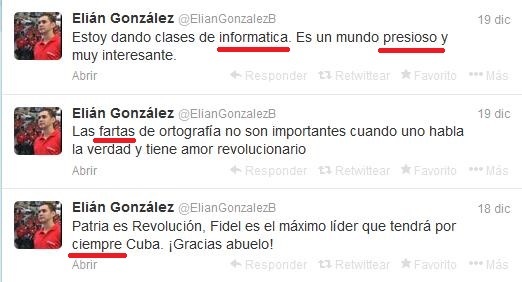 No mother makes plans for herself, and everything she did was to try to bring her child a future far from this dictatorship that today has been converted into a semi-literate, as can be corroborated in the Tweets that he has sent through the social networks from Ecuador. someone who found it impossible to string together a sentence. 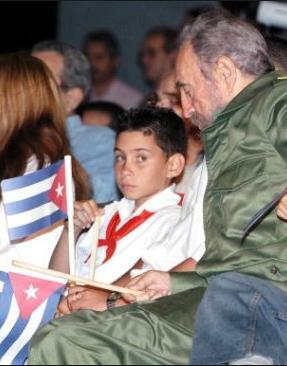 For the most part, those who pay little attention to studying engage in pillaging, and it was the crack he found that turned him into the political pawn of Fidel Castro, who dragged the Cuban people along, in exchange for the excessive expense of the rescue, he cried for the return of the child Elián. 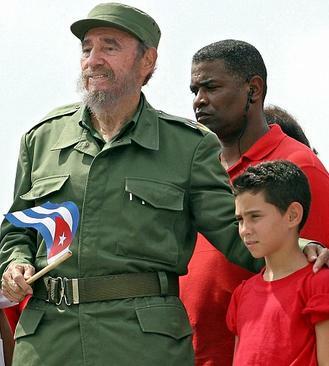 Everyone knows that for Castro, the thing of least interest was the child. His obsession was always the power struggle with the United States and winning, discrediting them before international public opinion. And the caudillo saw the immediate opportunity that presented itself. Now the dauphin has grown up in the dogmatism and interests of his father, who kept him in a military school (Camilitos), and having been certified as tames, it’s time to repay all the sleepless nights and expenses invested in him, or so think all his ideologues or trainers. They threw him into the ring of the World Youth and Student Festival in Quito to look horns with all who approach him with purposes other than the Cuban governments. Asked to comment on what happens, as if the fact of having survived his ordeal has immortalized him and turned him into an extraordinary being; because as far as studying goes, he shows no effort nor results. Fidel Castro shouldn’t have been allowed to do it so early, he should have demanded better preparation, and he should have send advisors and a personal guard to prevent access to his crazy views and his Tweets with serious spelling errors, that can’t be justified simply by the fashion of abbreviating or changing letters with similar sounds. In the end, life has proved his mother right: the child would have no future here. The best thing they could do is hide him away again, and so save themselves from the ridicule and bad image, or return him to Miami to be educated. Prison Settlement of Lawton. December 2013. 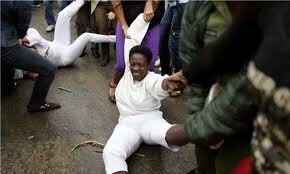 Is Cuba Now Celebrated by UN As Custodian of Human Rights Despite Blatant Violations??? Before allowing Cuba to become a bona fide member, the proper thing would be for the UN to kick Cuba out of the Human Rights Council. Just how on earth has it become possible for the Castro brothers to — without any trace of unease or embarrassment — shamelessly mock the international community of nations under the auspices of the UN? The great specialty of Cuban journalists is to inflate balloons, darken with dust clouds the reality of what happens in the archipelago, and, in passing, to lick the feet of the dictators. The most outstanding in this work are those who write for the Granma newspaper, who were chosen for it precisely: manipulable beings who practice a profession that they denigrate, disrespect, and who some day will come to form part of the anthology of the unremarkable. Oscar Sanchez Serra, in the publication last Friday on the 6th of this month, in the official press of the Communist Party, talking about the Universal Declaration of Human Rights, has once again demonstrated, by the cynicism with which he refers to the Magna Carta — our Constitution — calling it “dreams and illusions,” how disgusting it is to him to mention it. For the Castro government, it has been a stumbling block for the more than half century that they have exercised its flagrant violation, like all dictators, of course. No economic achievement (there are none), nor social, justifies the least deprivation of Universal Rights, whether they comply with them all or violate them. The hack believes that hiding in the historic calamities that happened in the world might justify those in our own country, and so, in that spectrum of examples that he mentions, like the Second World War until the more recent ones in Iraq and Libya, and world prostitution among other examples, he entertains the readers and makes them forget those that they violate before our eyes and remain silent about, like the beatings and arrests of the Ladies in White and the abuses against the opposition, in spite of recognizing that “Our little country is not paradise.” The reporter never mentions, I suppose out of respect for ridicule, that Cuba recently became part of the United Nations’ Human Rights Council; he does not even hint at national problems, hiding behind the manipulative machinery that the system exercises in the methods of revealing, in the best style of Nazi propaganda in the time of Hitler, and wears himself out citing what happens in the hemisphere, something like asking why ask for human rights for Cubans if the same thing happens in other parts of the world. And with cynicism he jokes about the United Nations’ Magna Carta. Really more than a journalist he lets himself be seen as an agent of State Security in the most humiliating service to the dictatorship. It was like a prelude to what happens in the days preceding the commemoration of December 10th, International Day of Human Rights. The arrests of the brave and peaceful Ladies in White once more occur for dozens of days before. Recently, on her arrival at the airport from Europe, the leader Berta Soler was abused, harassed and abducted to be taken in an official car which left through one of the side doors, and so to avoid her being received by her daughter and her husband Angel Moya (who on parole after being sanctioned in the Black Spring, forming part of those 75 opponents of the totalitarian regime, that remain standing as flags against the regime). 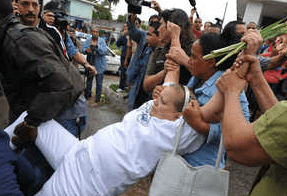 The abuses, outrages and detentions of the Ladies in White, are only the gasoline that fuels their silent protests, while they walk with gladioli in their hands. How much shame that journalist must feel who endorses the governmental abuses! Because it is not worth mentioning, comparing it with those semi-literate men and women who operate as henchmen, and are the instruments of punishment against the opposition, one supposes that it is not the case, that there exists a difference, at least you would want that; now we speak of supposed journalists, professionals who should love their profession, at least they should above all, and not in exchange for largesse, by miserable others, and accept pandering to a system that grows increasingly impossible to sustain. 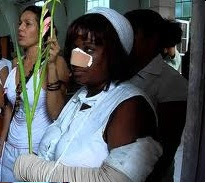 Again the Human Rights party in Cuba will be held with the pain of the opponents who expose their bodies to be beaten and confined in punishment cells, and unfortunately, also, to be attacked under the complicit silence of the corroded people, thanks to the terror imposed by the State, of those who live within and outside of the country, almost in their totality, because of institutional fear that assures and occupies itself with punishing all who confront it. Those within fear losing their work, their children’s education; those outside fear reprisals against family members that they left behind, and then that they would be refused the opportunity to come visit them. While that silence happens, women and men, legitimate children of this people, weary of famine, face each other in their streets demanding democracy. The Ladies in White endure the beatings and vexations. The space Estado de Sats will try to fulfill the program in a plural meeting in Havana in order to discuss the destiny of the future Cuba where all Cubans participate. The members of the UNPACU will end up confined, some with open cases and sent to prison, others returning home with fractures. That is the daily reality of the opposition on the island. Except that, in that same instant that the beatings and arrests occur, others see a film, open a beer, and watch their children eat ice cream, satisfied, they think that now they achieved their rights and now done their duty by Jose Marti!